Movies and Oil Change Savings?! Believe it! When you purchase the digitally restored Blu-ray™ or DVD of Steve McQueen’s iconic 1971 film Le Mans, you’ll receive a coupon for $7 off your next Jiffy Lube Signature Service® Oil Change. It’s a great benefit for you and your car-even if you don’t plan to drive in a grueling, 24-hour-long race in the French countryside. 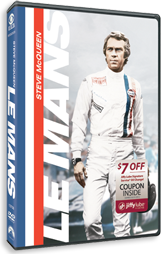 Offer applies only to the Le Mans Blu-ray™ and DVD advertised here, at participating retailers, while supplies last. Coupon expires 05/31/2012.